The panel discussion was moderated by Karen Remley, Founding Director, M. Foscue Brock Institute for Community and Global Health, Eastern Virginia Medical School. 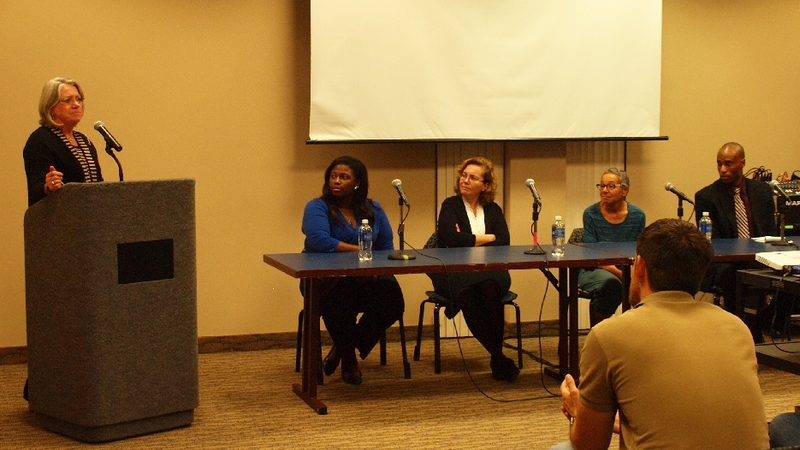 The panel members were (from left to right: Yvette Blai, M.S. Student at ODU and EVMS; Muge Akpinar-Elci, Director, Center of Global Health, ODU; Wendy Ring; and Dawone Robinson, Virginia policy coordinator, Chesapeake Climate Action Network. 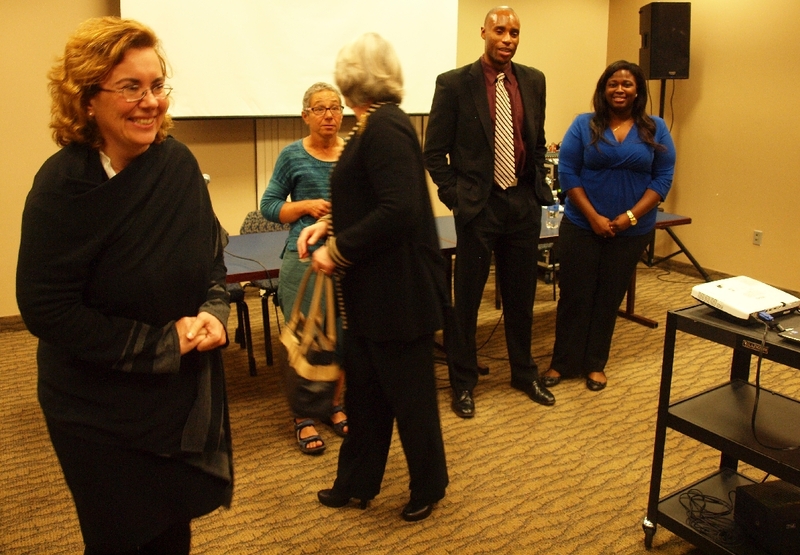 The Speaker and Panel members after the event (from left to right: Muge Akpinar-Elci; Wendy Ring; Karen Remley; Dawone Robinson; Yvette Blai, M.S. Student at ODU and EVMS). More than 50 participants listen to Wendy Ring of Climate 911, who presented convincing evidence of the many health impacts climate change is already today causing and a worrying perspective on what we might be exposed to if we are not successful in changing our lifestyle to one slowing down climate change. Besides the importance of each individual taking all small steps to reduce our impact on the environment and climate, the subsequent panel discussion emphasized the need to put pressure on our governments to create a policy framework with incentives facilitating the necessary changes in lifestyle. The importance of education focusing on environmental health was underlined. 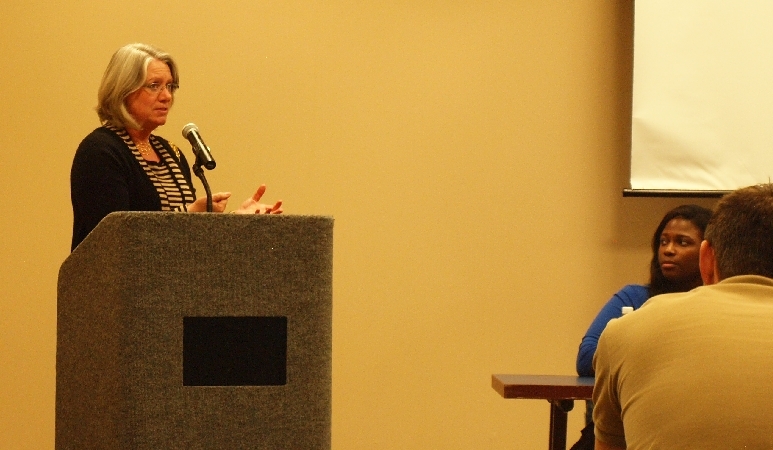 As part of a Speaking Tour, Wendy Ring, member of the Climate 911 gave a presentation on public health impacts of climate change and sea level rise. Dr Ring is a rural family physician trained in both medicine and public health who has devoted her career to meeting the needs of the medically underserved. In 1990 she founded a mobile clinic in northern California to care for the working uninsured, the homeless, undocumented immigrants, and others lacking access to health care. She served as Medical Director of the clinic until 2011, when she left full time clinical practice to work on climate issues. Dr Ring has been recognized by the US Congress, the California State Legislature, and the California and American Medical Associations for her innovative work and was named one of America's Five Best Doctors and the nation's Best Healer by Readers Digest. Dawone Robinson, Virginia policy coordinator, Chesapeake Climate Action Network. The rise in local sea level experienced in Hampton Roads has the potential to affect human health negatively in several ways. Increased inundation will lead to more abundant water-borne and vector-borne diseases. Increased salinification of coastal groundwater resources will degrade and reduce the resources for potable water. Inundated infrastructure, including infrastructure with toxic substances could lead to pollution of water and reduced air quality. Increased surge heights could lead to failure of coastal protections and cause large disasters. Increased inundation during storm surges could disrupt health infrastructure in a time when this infrastructure would be most needed. Displacements of population caused by coastal flooding would increase health threats in several ways. Understanding these vulnerabilities of human health related to sea-level hazards is crucial for the planning of resilient coastal settlements. 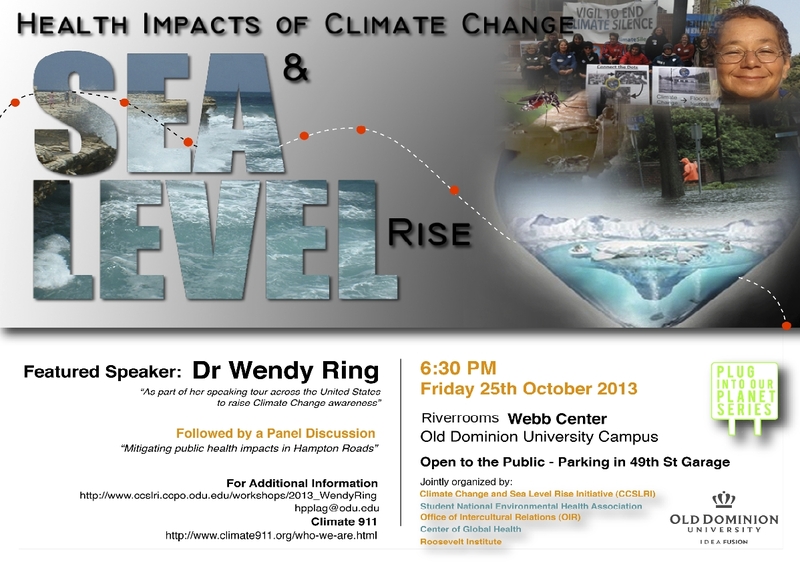 The event was jointly organized by the Climate Change and Sea Level Rise Initiative (CCSLRI), the Student National Environmental Health Association at ODU, the Office of Intercultural Relations (OIR), and the Center of Global Health. The event was part of the “Plug into the Planet” series of events initiated by the Social Entrepreneur Council (SEC). 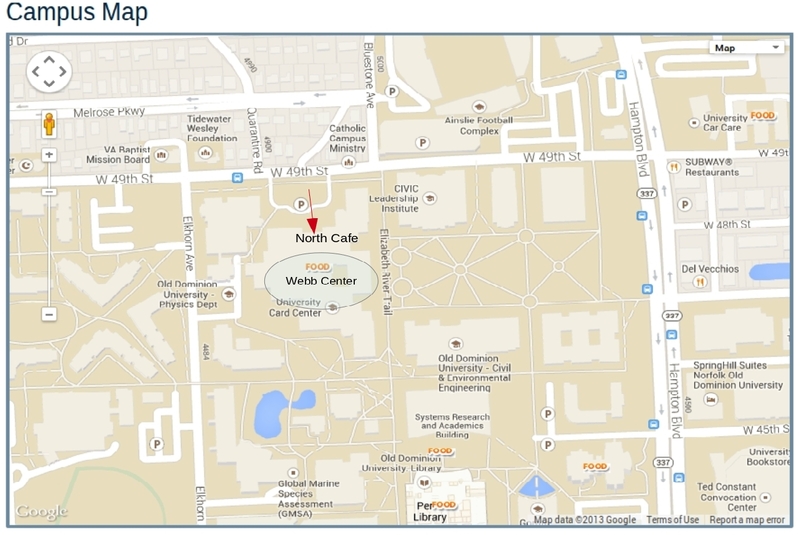 Parking at ODU: For information on parking at ODU, please read here. Event parking was in the 49th St Garage. After 4:00 PM, free parking was allowed in all areas except those marked “Reserved.”. 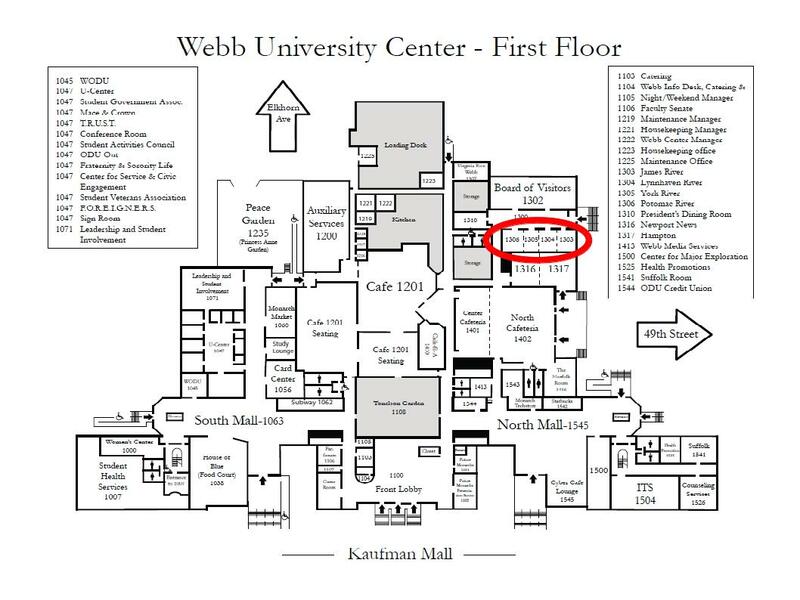 All of the reserved spaces in the garage are located on the first floor. The metered area in the 49th Street garage (Stadium Garage) were not be enforced after 4:00 PM on October 25, 2013, so that participants could use the metered spaces without paying.